On a Intel DN2800MT-based system, so having Graphics Media Accelerator 3650 integrated processor graphic card, your screen turn to black/off during the boot process, exactly starting when the system switch to framebuffer if you connect a VGA screen (no problem so far with HDMI). Passing nomodeset or any similar option is of no help. You cannot invent it, apparently GMA 3600 kernel DRM driver always assumes there is a LVDS panel, as it would on laptop but probably not on home servers, and defaults to a 1920×1080 panel. There are plenty of ways to get TV broadcast on a workstation. You can browse TV show website that provides it. You can use software like VLC that will connect to whatever server (that may be an ISP router) that will serve such broadcast. Freebox is somekind of ADSL modem/router modern enough even to carry a harddisk, provided by the French ISP Free.fr. Freebox provides several output plugs for video stream: HDMI, S-Video, numeric audio and one called “TV”. What is of interest to me is to make use of my Freebox stream with my workstation just as if it was a mere TV set. I do not want to use a specific software that will connect to whatever address, I do not want to use a specific video player. I just want to mimic the TV-set behavior. And so forth, it should run on whatever Operating System. Debian GNU/Linux, obviously, since that’s what I’m using, but any other else if wanted. If I were using a real TV set, I would have two options: using the HDMI plug, if my TV-set supports it, to gain high-quality image ; using otherwise the SCART (called Péritel in France) cable with an adaptator in the “TV” plug. The hardware is on one end the Freebox HD, as shipped by Free.fr. On the other end, the workstation is recent enough, with modern video controller (ATI Radeon HD 4870) and “hybrid video recorder” (WinTV-HVR-1300, sold in Europe) which means in its producer’s marketting slang that it supports both analog and numeric streams. But actually, it does not, since all it’s video input plug are analogic (Composite video and S-Video). 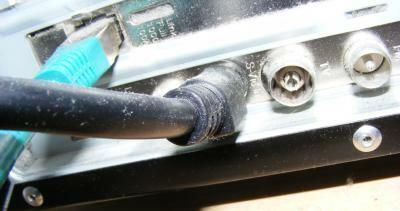 Will also be necessary a S-Video cable, adaptator “TV” to SCART and a RCA stereo cable. 1) Plug the S-Video from the Freebox to the WinTV-HVR-1300 (or any similar card that have a S-Video plug). Then you should be able to get video. 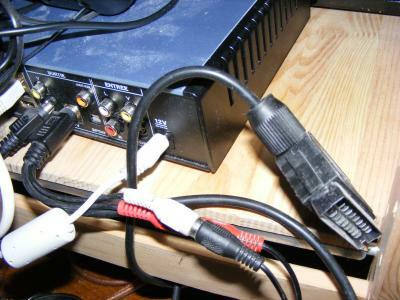 2) Plug the adaptator “TV” to SCART in the “TV” Freebox plug, connect it with the RCA stereo to your tuner or workstation soundcard. This looks clumsy, as the SCART part (that handle video) is dismissed, and surely could be improved. Nonetheless, then you should get audio. Regarding sound output, it depends whether you plugged the output in a classic tuner or in your workstation soundcard (or even in the video recorder card, that is also an audio recorder card, at your convenience). But that should be easy-going. Here it works with MPlayer. But it could work with plenty other video player, whether they are dedicated to TV (like KDEtv) or not making no difference. It is also easy to envision how to really record video with this setup (if you have the audio going through your workstation soundcard). I’m sure there is room for improvement here. I’m not very fond of the idea of using through this SCART / RCA stereo cable. But it works. I guess next step would be to use HDMI directly.